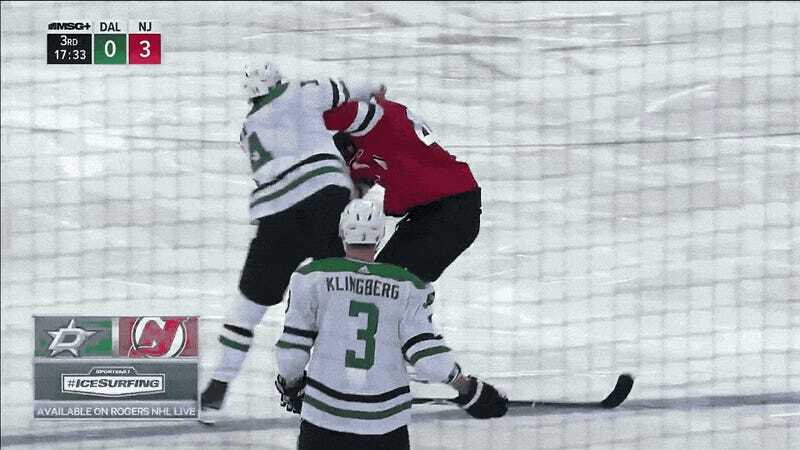 The Dallas Stars have had a less-than-ideal start to their week, falling 4-1 to the lowly Ottawa Senators on Monday and then getting their asses beat by the undefeated New Jersey Devils on Tuesday. With his team down 3-0 in the third period, Stars star Jamie Benn was a little bit peeved. Young Devils winger Miles Wood, though? He might just always be on the verge of destruction. Aside from a rough hit and some extra aggression that earned him a suspension last season, Wood already this year has gone after a bemused Alex Ovechkin, and cheerfully lost a tooth on Sunday after a collision with Brent Burns. This kid is spoiling for a scrap and has no fear. One of these dudes is mega frustrated, and another just might be a bit insane, so the pair let it all out in the third period after a minor confrontation at the faceoff circle. The fight between the two was a wild punch-fest, and neither of the participants was going to slow down before the other. Benn even gets off the ground at one point to keep firing back. This is a very poor way to solve your issues, but it’s damn compelling hockey.